Kurlee Belle: MYTH: I am natural now therefore I no longer need a trim. MYTH: I am natural now therefore I no longer need a trim. Split ends occur when the protective cuticle of the hair shaft has been stripped away causing the hair to split into two. This unwanted process can occur at any point along the hair shaft and travel to the root. Therefore, it is important to nip these suckers in the bud as soon as possible. 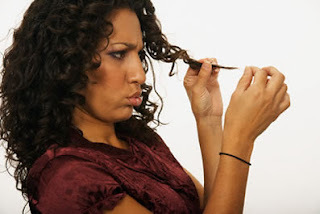 The main cause of split ends are dry damaged hair i.e hair that is not well conditioned or moisturized. Since curly hair is more susceptible than straight hair to dryness, it is important that you keep a watchful eye on your ends.